Description of Ontario Place from <em>Toronto Guidebook</em> (Toronto: Key Publishers, 1974): <br /> <br /> "If it looks like a scaled-down version of Expo 67, it may be because many of the same brilliant designers worked on both. Like Expo, Ontario Place is built in, and over, the water on about 96 acres of land on three man-made islands. Like Expo, it’s an attempt to glorify Ontario’s past, present and future by building a park-like amusement centre around a series of indoor films, displays and exhibitions. It’s great fun: a far better experience, really, than the overcrowded tackiness of the Canadian National Exhibition. It contains 10 restaurants, three licensed lounges, nine snack bars, a film theatre with the world’s largest indoor curved movie screen, the world’s best kids’ playground (that’s not just our opinion; it’s also the opinion of the tens of thousands of kids who have visited it), a floating museum that used to be a World War II destroyer, acres of rolling parkland, an outdoor concert hall, a marina and a pavilion consisting of five steel-and-glass “pods” 40 feet above the water, which contain the reception area and some of the restaurants. "<br /> <br /> Photo by Ellis Wiley. City of Toronto Archives, Fonds 124, File 9, Item 54. 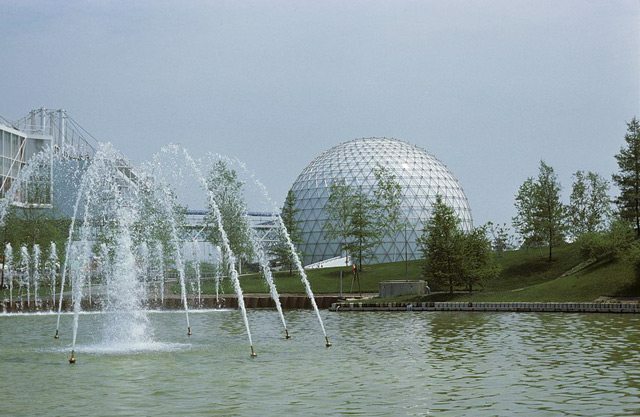 Born out of what could be called “Expo 67 envy,” Ontario Place was originally designed to be a park where the cultural and economic accomplishments of the province could be celebrated, with a side order of entertaining diversions. While the early exhibits flopped, Ontario Place became a spot where children played, teens saw their favourite acts at the Forum, adults enjoyed a drink, and everyone caught a film at the Cinesphere or watched the crowds drift by. Though its early programming was geared to all ages, the park has evolved into a haven for younger visitors, which some have pointed to as a reason for declining attendance. Today, we found out that Ontario Place is largely shutting down, effective immediately, in anticipation of a planned redevelopment of the site. As Ontario Place prepares for its latest makeover, a look back at its first two decades.